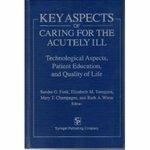 "Key aspects of caring for the acutely ill: Technological aspects, pat" by Sandra G. Funk, Elizabeth M. Tornquist et al. Contributing authors: Gleason, E., Grossman, S., & Campbell, C.
Gleason, E., Grossman, S., & Campbell, C. (1995). "Minimizing diagnostic blood loss in critically ill patients". In Key aspects of caring for the acutely ill: Technological aspects, patient education, & quality of life. (pp. 220 – 225), by S. Funk, E. Tornquist, L. Copp, New York, NY: Springer Publishing Company, Inc.
Funk, Sandra G.; Tornquist, Elizabeth M.; Copp, Laurel A.; Gleason, E.; Grossman, Sheila; and Campbell, C., "Key aspects of caring for the acutely ill: Technological aspects, patient education, & quality of life" (1995). Nursing and Health Studies Faculty Book Gallery. 26.